Ulrich Ostergaard contributed 10 of Panthers' 15 points in the Premier League pairs event. 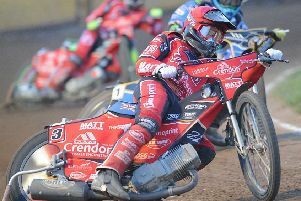 Peterborough Panthers suffered another night (July 8) to forget in Somerset. The city club’s pair of Ulrich Ostergaard and Nikolaj Busk Jakobsen bowed out in the group stages of the annual Premier League Pairs event at the South-West venue, where Panthers were recently thumped 62-28 in a KO Cup tie. Nicolaj Busk Jakobsen struggled in the Premier League Pairs event in Somerset. The Panthers duo could only manage 15 points from their four outings in a format where a victory is worth four points, a second place worth three and a third place earns two. Captain Ostergaard provided two-thirds of their points with 10 compared to the five managed by his Danish countryman. They were on the receiving end of a 7-2 from Workington in their first outing before going down 5-4 to Newcastle despite an Ostergaard victory. They also lost 7-2 to hosts and eventual winners Somerset before ending on a high with a maximum of their own against a Glasgow side already through to the semi-finals. PREMIER LEAGUE PAIRS RESULTS . . .